The CradlePoint CTR500 Cellular Travel Router creates a secure Wi-Fi Hotspot from broadband enabled cellular data modems. The CTR500 is the world's most compact router that is able to support BOTH ExpressCard and USB-style Cellular Modems. 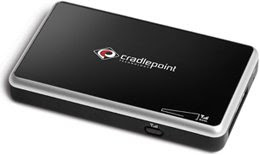 Powered by CradlePoint's WiPipe™ technology, it supports a wide variety of modems and handsets on the ATT, Verizon, Sprint, and Alltel networks and gives users hassle-free Wi-Fi access nearly anywhere. The high-performance router platform supports multiple and concurrent VPN pass-through sessions, plus encryption modes including WPA2 Personal and Enterprise to provide secure client access. Unique built-in auto-failover between broadband sources enables wireless backup applications and maximum uptime. CradlePoint's built-in Setup Wizard provides diskless set up of security settings - getting a remote workgroup up and running quickly regardless of OS or device-type on the network. For site selection and placement convenience, the CTR500 also includes a signal strength mode, which enables external LED indication of cellular signal strength.